Aidan Piraino is one of 16,000 semifinalists out of nearly 1.6 million students who qualify. 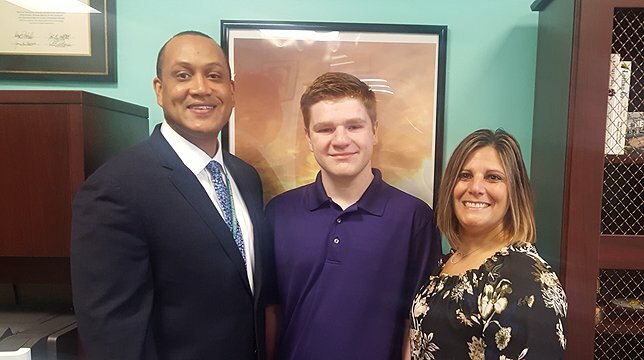 (L to R): Samuel Thompson, principal of Farmingdale High School, Aidan Piraino, National Merit recipient, and Cara Molina, a Farmingdale High School guidance counselor, stand for a photo following Piraino’s National Merit Semifinalist recognition. Farmingdale, NY - November 1, 2017 - Farmingdale High School student Aidan Piraino was recently selected as a National Merit Semifinalist. Piraino is one of 16,000 semifinalists out of nearly 1.6 million students who qualify for the National Merit Scholarship. The National Merit Scholarship program, which began in 1955 by The College Board and the National Merit Scholarship Corporation, recognizes students’ exceptional performance on the Preliminary Scholastic Aptitude Test (PSAT)/National Merit Scholarship Qualifying Test. In February, the semifinalists will hear if they have advanced on to be a finalist. This achievement demonstrates the success of the Farmingdale School District’s dedication to academic excellence. For more information about the Farmingdale School District, please visit the District’s website www.farmingdaleschools.org. Subject: LongIsland.com - Your Name sent you Article details of "Farmingdale School District Student Recognized as National Merit Semifinalist"